We are into making of Bone lever and Bone hooks which are made using quality raw materials. Our offerings include wide range tools having many applications. The products made by us are completed with all the precision. We are well known Bone lever manufacturer providing products at market leading prices. We have also earned great reputation as retractors supplier. Keeping in mind the specific requirements of our clients, we are engaged in manufacturing and exporting a comprehensive range of Serrated Bone Lever. We have made our range of these levers as per the specific requirements and demands of the clients. Clients can avail our range at most affordable rates in the market. We are reputed manufacturers of Bone Hook. It is an orthopedic tool which is used to hook the bone. These have a very pointed hook which helps in gripping the bone firmly. It is made up of Stainless Steel which enables it to tackle corrosion. 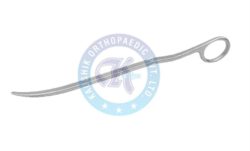 Kaushik orthopaedic corporation is the leading manufacturer of Threthowans Bone Lever. It is a tool used in orthopaedic medical sciences to carry out a operation on bones. It helps in keeping the bone stiff and well under the control of the doctors. These are engineered to perfection. These are very durable. It is generally used to operate on small bones. From the past couple of years, we have engaged in manufacturing and exporting an exclusive range of Skin Hooks. These hooks have been fabricated by utilizing the well selected and quality checked stainless steel that increase their strength and provide them longevity. These instruments are used in peeling off the skin layers of patients. Backed by a team of adroit and highly dedicated professionals, we are engaged in manufacturing and exporting a huge gamut of Bone Levers. Our range is used in orthopedic medical sciences for holding the bones firmly. We offer these levers in 10.5” long size and at most feasible rates in the market. our hi-tech facilities and well-trained professionals enable to deliver the range within the committed time frame. Looking for “Bone Lever and Hooks”?